The New York Red Bulls honored Bradley Wright-Phillips by announcing that no player will wear his number ever again in the organization. General Manager Marc de Grandpre said that the No. 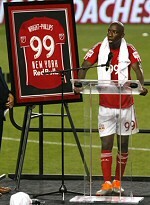 99 will never be issued to another player once Wright-Phillips hangs up his boots, whenever he so chooses. The number will not be issued throughout the entire organization, from the Academy to the MLS team. Wright-Phillips recently became the fastest MLS player to score 100 regular season goals, doing so in just 159 matches. BWP was also honored with a special game ball, a commemorative one-of-a-kind hat and a special watch, with "100" hand-etched on the back. The Englishman has scored 118 total goals for the New York Red Bulls, across all competitions, including the MLS Cup Playoffs, U.S. Open Cup and CONCACAF Champions League. Wright-Phillips entered the MLS scene on August, 25, 2013 against Chivas USA. Five matches later, Wright-Phillips scored his first league goal at Houston on October 20. The next season he went on to score 27 regular season goals, securing his first MLS Golden Boot. BWP scored 24 goals in 2016 and a second MLS Golden Boot. With 17 goals in 2017, Wright-Phillips was the second player in MLS history to record 15-plus goals in four consecutive seasons, joining Robbie Keane. Only three other players in league history have scored 15+ goals in three or more consecutive seasons. Per Elias, 18 players have scored 20 or more goals in an MLS season, while BWP is one of only two players in league history to do so twice in their MLS career.